A Cargoo is quick and easy to transport children, goods or other cargo around. It is Winther’s most flexible model and can take up to 100 kg. A Cargoo offers excellent road-holding capabilities, and it is easy to maneuver – also when you have to cut corners while carrying a load. The steering system is a head-tube solution with steering damper for a comfortable, stable ride. The spacious box is 86 cm long and 70 cm wide. It has a lower front, so it is easier to lift children or heavy objects to and from the platform. The front has a stirrup making it easy for children to climb onboard themselves. A Winther Cargoo can take 100 kg in addition to the driver. The seating in a Cargoo is versatile. Specify how you want the seat solution at the time of order. Most common is to have two seats placed at the rear end, but you can also choose to start with just one seat. The Cargoo holds up to a total four children. When it is just two sitting at the rear end they can measure up to 135 cm. It is also possible to bring your baby(ies) along – the Cargoo holds up to two babies fixed in the middle of the box. 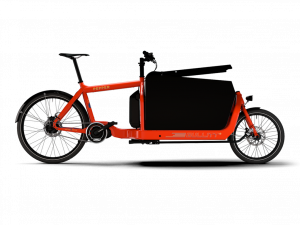 The top edge has been reinforced using a steel tube, and all components are of high quality, so it is built to last whether you use the bike for personal or business use. and comes with hydraulic disc brakes on the front wheels, puncture resistant Schwalbe tires and 7-speed Shimano Nexus as standard. Seating solutions, cover and other accessories must be specified when ordering. E-solution is also an option. We recommend this if you live in a hilly area, carry a heavy load or just prefer to get there faster. The frame comes in red, black, silver, blue and white and the covering hood is available in black, blue, red or transparent. A flat cover is available in black or red. All of these colors can be combined as desired. Color combinations Frame: Black, red, blue, silver and white. Front wheels 20×1.75 with mono-suspended hub, double-based aluminum rim and hydraulic disc brakes. Rear wheels 26×1,75 with internal gear and footbrake. Dimensions Length: 207 cm, width: 89 cm, height (to handlebar): 114 cm, height with hood: 126 cm Box height rear end: 45 cm, box height front end: 32 cm. Cabin dimensions Length: 86 cm, width: 70 cm, head height above seats rear end 74 cm.